In this brave, beautiful, revealing, and deeply personal memoir, Selina Meyer, one of our most beloved former presidents, tells her own extraordinary story. Born and raised deep in the American heartland of God-fearing suburban Maryland, young Selina Eaton learned to love her country and her fellow man from her parents, Catherine, a sportswoman, dog lover, and philanthropist, and Gordon, or “Daddy” as she always called him, a businessman and entrepreneur. From an early age, Selina, an active, curious, happy-go-lucky child, showed an uncanny ability to relate to others and to solve their real-world problems with real-world solutions. In this she was inspired by her idol: feminist, humanitarian, stateswoman, and first lady, Eleanor Roosevelt. Born and raised in Manhattan toward the close of the nineteenth century, young Eleanor Roosevelt lost her socially prominent parents, Anna, a famous beauty and horsewoman, and Elliott, a charming and alcoholic horseman, while still a child. She married her fifth cousin, Franklin Roosevelt, in 1905 and nursed him through a life-threatening bout of polio. When he was elected president in 1932, Eleanor broke with centuries of tradition that circumscribed an extremely limited and non-controversial role for the first lady and became an outspoken advocate for the less fortunate. After her husband’s death she devoted herself to worthy causes for the remainder of her life and is still regarded as one of the most beloved, respected, and admired women in the world. Roosevelt maintained a lively relationship with many prominent figures of her time, including Adlai Stevenson, John F. Kennedy, Albert Schweitzer, and probably Pablo Casals. She inspired countless women to break out of the established roles for women in society, among them the pioneering aviatrix Amelia Earhart, with whom she flew several times. Born in Atchison, Kansas, a decade after Eleanor Roosevelt, Amelia was raised in a family of lawyers and judges who encouraged her adventurous spirit and that of her siblings and cousins. A tomboy from an early age, Amelia endured a peripatetic childhood as her father, Samuel, also an alcoholic like Eleanor’s dad, sought steady employment accompanied by her mother, Amy. An early attempt at a nursing career was curtailed when Amelia herself became ill during the Spanish flu pandemic of 1918. After discovering her love for flying, Amelia attempted steadily more daring feats, including a transatlantic flight one year after Lindbergh’s and a solo transatlantic flight in 1932. Dubbed the “Queen of the Air,” Amelia Earhart captivated the nation both with her bravery, skill, and daring when flying her planes and when challenging society’s hidebound attitudes as to what constituted a proper place for women. America mourned when she disappeared mysteriously somewhere in the Pacific during an attempted around-the-world flight in 1937. Speculation continues to this day as to Amelia’s ultimate fate, even as hope has faded that she may yet be found alive. With wit, wisdom, eloquence, and fearless honesty, Selina Meyer reveals for the first time what really goes on in the halls of power, including the ultimate hall, the White House. It’s all here: the triumphs, the tragedies, the personalities, and the momentous events that have shaped our times, brought together in a page-turning tale told as only Selina Meyer could tell it. Selina Meyer’s compassion, her sense of humor, her grace, and her uncommon willingness to bare her heart make this story revelatory, beautifully rendered, and unlike any other president’s memoir ever written. First Woman: A Woman First would be a fitting title for a book about Selina Meyer, Eleanor Roosevelt, or Amelia Earhart, but in this case, it is about Selina Meyer. In 2012, Selina Meyer made history when she was elected the first female vice president of the US as the running mate of President Stuart Hughes. When Hughes resigned in 2016, Meyer again electrified the world when she took charge in the Oval Office. Working round-the-clock with her signature drive and intelligence, Meyer managed to overcome decades of government indifference and inertia to create signature initiatives on a broad variety of fronts. "Well, here it is. Selina Meyer’s book." 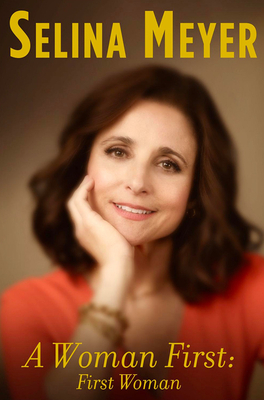 "I was pleasantly surprised the first time I read Selina Meyer’s new book and I am guessing so was she." "I heard she was writing a book." "Just tell her I’m traveling and don't have time to read it." "Forthright. Honest. And very, very wise but a missed opportunity to tell the story of her struggles with mental health and her stay in the lunatic asylum." "Catherine Meyer is a private individual who has spent her life establishing a positive reputation. Nevertheless, we have been reliably informed that a new book by her mother, former president Selina Meyer, contains untrue and defamatory statements about Ms. Meyer. Under the laws of New York State, it is unlawful for an individual to make deliberate statements, either verbally or in print, that will harm a person's reputation without factual evidence. This will serve as a pre-suit letter demanding that you provide us written assurance with 30 days that you will cease and desist from making any such statements either in print or in person."